Darren McCauley takes on Kym Nelson. Ards produced a dogged rearguard performance to deny Coleraine at the Bangor Fuels Arena. 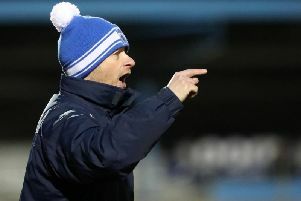 Colin Nixon's side defended for their lives in the stalemated as new Bannsiders boss Rodney McAree watched on from the sidelines. The visitors suffered a blow before the game as Josh Carson was a late withdrawal with a hamstring injury. In a scrappy first half Coleraine had the better of the chances as Stephen O'Donnell crashed a header off the bar just after the half hour. There was further disappointment for the Bannsiders as Gareth McConaghie was forced off with a hip injury following a collision with Kym Nelson in the build up to O'Donnell's chance. Coleraine upped the ante after the break as they brought wave after wave of attacks on the home goal. The best came from Stevie Lowry on the hour mark as Aaron Traynor picked him out in the six yard box, but Sam Johnston produced a stunning block to deny the midfielder. More half chances fell the way of Coleraine in the final exchanges with McGonigle, Bradley and McCauley all trying their luck but to no avail.